This is a spiral jumping ball game, super easy to play and quite interesting, spell bounding the users.Spiral Jump is also being used as a concentration improvement tool by millions of gamer already, apart from the gaming experience it provides. The objective while playing is to get your bouncing ball downwards through the spiral, crossing the steps by escaping danger step it via jumping from one step to another by rotating spiral. This game will make you forget time and surroundings, Spiral Jump is one of the most interesting new game of the year 2018! So what are you waiting for? Come and have an enthralling experience with gravity pulling you down at fascinating speeds. A good way to show off your skills! 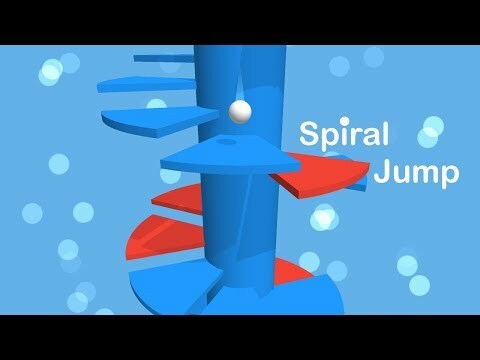 !Game Features:☆ This fascinating bounce ball game, Spiral Jump is full of adventure.☆ Single Touch Control Spiral.☆ Spiral Jump is among the most popular games in new game 2018. ☆ This spiral jumping game is easy to grasp and play.☆ Great visual and sound effects.☆ You can select different type of colorful ball from ball collection.☆ Now you have 3 type of spiral step selection for joyful game play.☆ Different type of game background music.☆ Spiral Jump you can play the game indefinitely without any time limits.☆ Spiral Jump comes in a very convenient file size for easy and quick downloading.☆ Unwrap different spiral patterns as you play this jumping ball game to avoid monotony and keep the player engrossed.☆ You can beat your own high score in Spiral Jump (a new ball game 2018).☆ Keep a record of all the points you are earning with scores being updated in real time.We are continuously in the process of upgrading and improving this game, so any feedback and suggestions towards the same are welcome! How to Play:✓ Playing this ball jumping game is thrilling and full of fun.✓ Your main aim in this bounce ball game is to bring the ball down earning maximum points in every go.✓ You travel down by moving through escape points in the spiral shelves where they are turning in reverse order.✓ The spiral can be rotated in both clockwise and anticlockwise directions by horizontal movements of finger on the screen.✓ Danger planks must be avoided at any cost as they lead to “Game Over”✓ And an additional bonus is that there are no time limits…play as much as you want.✓ You have to avoid all obstacles while moving your way down.✓ The goal of the game is to earn maximum score possible. Thank you for loving our game. We have added lots of new colorful balls and three different types of spiral steps with background music.